Last spring, when I ended up in Modena for a day trip during BlogVille, the main reason for my visit was to sample the exquisite traditional balsamic vinegar and to check out the Ferrari Museum. However, as I was rushing to make it on time for my appointment, I stumbled upon a magnificent mural by Italian artist Blu, depicting a mechanical crocodile eating a forest. This mural was created in 2009 as part of the Icone Graffiti Event. 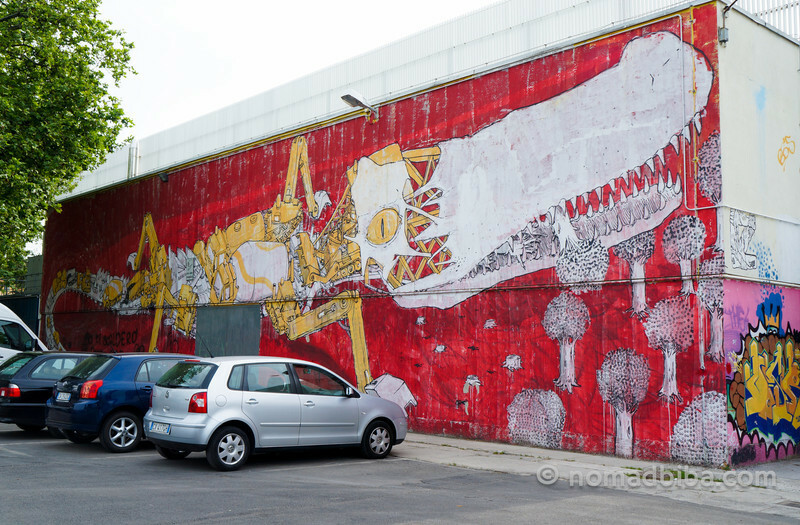 As I walked past it, I realized that much of the building’s walls were covered in street art; I took note of the site so I could come back after my meeting, but it wasn’t too hard to make it back since it’s just across from Modena’s bus station. It turned out that there were a couple more of his works as well. 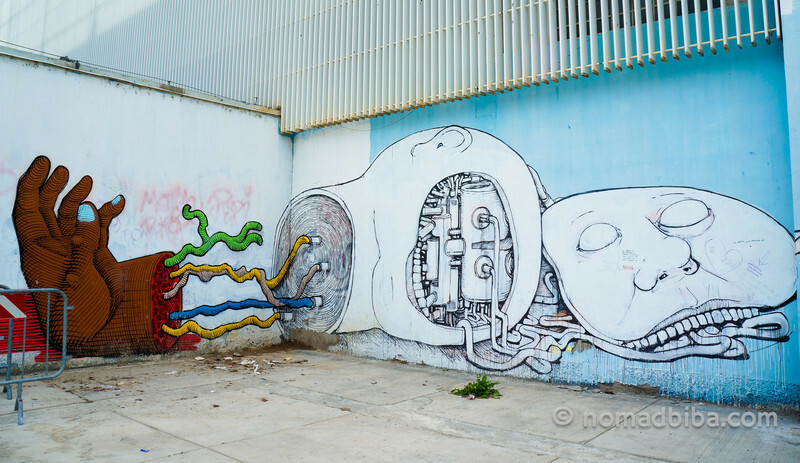 The one pictured below was created in 2010 and is a collaboration with Brazilian artist Nunca. To end my tour of this sight, there was another massive mural on one of the sides of this same building; it features an octopus with its tentacles around a couple of some rich and powerful looking hands. This was another collaboration with fellow Italian artist Ericailcane and it was apparently made during the 2011 edition of the Icone Festival. However, my luck didn’t finish there and as I was navigating the intricate streets of Modena’s old town I came upon another cool piece of Ericailcane’s work. Again, the social message wasn’t so subtle here either; as there was a rodent figure holding a bunch of Euro coins tied with a rope around its neck, and looking pretty much ready to jump from a cliff. In the end, it was great to find these much street art in Modena, and so many art works from my favourite artists; it made me wish I’d stick around longer to see what else I could find. Oh, well, I guess it’s a reason to go back again sometime! My visit to the Emilia-Romagna region in Italy was part of the BlogVille project, an initiative by the local tourism board to promote their region through bloggers. For more information, you can visit their website here. However, all views and opinions are strictly my own. For the rest of my photos from Modena, visit my gallery here. Italy seems to hold a lot of events for Street Art. I recently came across the results of one in Foligno, Umbria. Great photos but I’m so glad you mentioned all of the street artists. I’ve only seen Blu’s work before (in Berlin). I just love learning more about the artists. I read so many posts that just show the photos and the writer hasn’t taken the time to find out who the artist was. How did you research who the artists were? Was it by looking up the Icone Festival? Hi John, thanks for your comment! For this particular post, it wasn’t hard to find out the names of the artists because I’ve become familiar with their work and recognize their style. The one that I hadn’t seen any work from, was Brazilian artist Nunca. Sometimes, it’s not easy to find out the artist’s name before publishing a post; but it has happened to me that later, in another city I come across another piece with a similar style or someone adds a tag to my photos with the name (in Flickr or Instagram) and then I go back and add the name in any posts/photos I have taken previously. Also, for artists that I follow, I check their websites before going to a city to see if they’ve done anything there and make sure to find their work. It’s fun! Thanks, Gary! I’m glad you’ve enjoyed my post :) Happy travels to you as well! 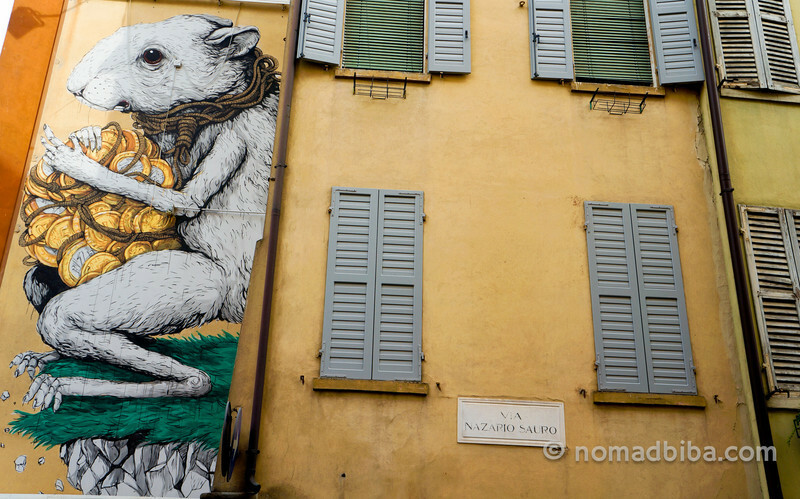 Street Art is one of our biggest loves, so it looks like Modena’s heading on to the ‘Must-Must See’ list.